Previously published as Murder Most Unladylike in the UK. "A pitch-perfect snapshot of adolescent friendship... A sharp-witted debut for Stevens, one that will leave readers eagerly awaiting subsequent installments." "[A] delightful romp....This book, the first in a series, is a "jolly good read," one which intermediate girls will enjoy and share." 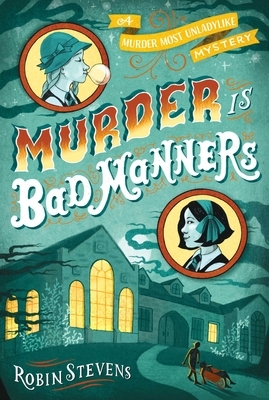 "[A] first-rate homage to English boarding school adventure and period murder-mystery tales....Middle-schoolers with a taste for Agatha Christie (and perhaps PBS costume or mystery dramas) will eat this up and ask for more." “Wells and Wong . . . leave readers eager to read more of their appealing tales." "Stevens’s engaging tale shines with the reflected charms of its detecting duo, a winsome combination of thoughtfulness and relish." "A skillful blend of golden era crime novel and boarding school romp, with a winning central relationship between plump, anxious Hazel, a new girl who has arrived from Hong Kong, and the super-confident blonde English rose, Daisy Wells. The novel works well both as an affectionate satire and an effective mystery story. . . . Top class." "Satisfyingly unpredictable. I did not guess the whodunit. Ripping good fun." "Friendship, boarding school, and a murder worthy of Agatha Christie." "Really cleverly done and unexpected for what I thought would be a straightforward whodunit caper." "Reading Murder Is Bad Manners is like drinking cocoa by a fireside: It is warm and witty and deeply satisfying." "Murder Is Bad Manners lured me in with a charming British voice, and then, just as I started to get cozy, snap! I was trapped in a serious mystery problem. Robin Stevens develops her girl detectives with a light, deft touch and delivers denouement with a flourish."